As fashionable as it is functional, our mini purse shaped manicure sets are perfect for your next spa-themed girls' night, holiday parties, or corporate events. 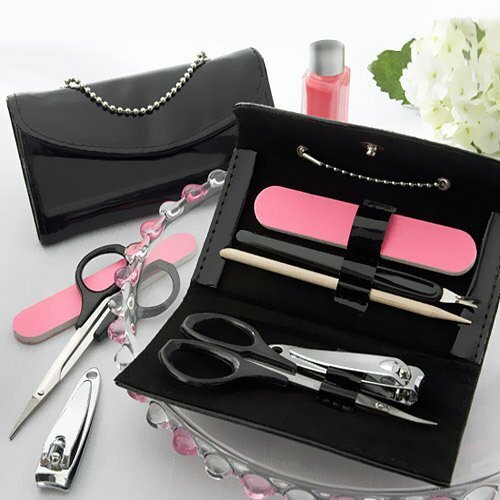 The black purse set contains a manicure set complete with nail file, cuticle pusher, orange stick, nail clipper and scissors. The shiny black patent leather bag features a silver chain handle and snap closure with an interior lined in soft, black velvet. Closed, the purse measures 4.25"L x 0.5"W x 2.25"H.
Create a party favor combo your guests will love-and will really use-by giving our equally practical heart shaped tea infuder and handbag-shaped purse hooks.